Initially the most appealing option was the last one. I've loved the idea of bike-engined cars ever since the Rocket, and I was seriously tempted by a Caterham Blackbird for sale at a comparatively reasonable price, and just about justified it on purely financial terms once I took account of the need for a chassis-up rebuild of my car within the next couple of years. Unfortunately I came to my senses - there's little experience of how a bike engine stands up to daily use in a car, and the fuel economy (I know, but it's important when you do 12,000 miles a year) is dire. I spoke to Dave Andrews today about the two remaining options. Given what's likely to be wrong with the engine (taking into account my earlier problems too), it wouldn't be economic to fix. It's a much safer bet to get a newish 1800 and go from there. "Go from there" because a standard 1800 should have more low-down grunt than my engine, but ultimately less power, so I'd want to tune it. I wanted to tune my engine anyway, so this is the perfect excuse. Dave pointed me to someone selling an 1800 K apparently out of a 3,000 mile MGF, which has the advantage that it's very unlikely to have been on a race track. Because it's quite new (a good thing) it's an EU3 model (a bad thing since my ECU is EU2). Dave said it's quite easy to move over the cam cover and coils from my engine, and you also have to fit a rotor arm spigot to the inlet cam which again he said was easy. It's also necessary to grind part of the block away near the starter, but that's not difficult if you've already got a Caterham K to follow. I'll phone about the engine tomorrow. The positive way to look at this is that it's an opportunity... I've fancied doing things to my car, and this is the perfect excuse. The gearbox. I've got a standard Ford Type 9 gearbox (originally from a Sierra), and while 1st gear is probably great for towing a caravan up a 1:1 hill it's got no place being in a Seven. 2nd to 3rd is quite a big jump, and 5th could do with being slightly less of an overdrive gear. Ideally I'd like a Caterham 6-speed box, but they are way too expensive (~£2700!) so whilst the engine is out I will likely take the opportunity to swap in a BGH-tweaked Type 9, with improved ratios. I'll also ask around an see whether it's worth fitting a lighter flywheel at the same time. The engine. Received wisdom is that the 1600 SuperSport ECU can cope with an 1800 engine, but you need an aftermarket fuel pressure regulator to increase the pressure to 4 - 4.25 bar. I like what I've heard about Ks with the Emerald M3D ECU fitted, and I'd like to fit throttle bodies and cams for a power hike. In DVA terms this is a K04 kit, and Dave also recommended a "quick & dirty" port of the head to make the most of it. This should take it to 170+ bhp with excellent throttle response, and it should sound rather nice too! Swap cam cover and coil pack from old engine. Need new gaskets etc? Buy serial / USB adapter for my work laptop so that I can tweak things. Rolling road run at Emerald (if there isn't a decent map floating in the ether). Tell DVLA about new engine number and increase in capacity. Tell insurance company about increase in capacity and power. Visit DVA for cams, throttle bodies and a head job. It's going to be a pain whilst all of this is happening but the end result should be worth it. Fingers crossed that I can at least get the car back on the road before Christmas! 10th November 2003. I phoned about the engine. Somebody has beaten me to it so unless the deal falls through then I will need to look elsewhere. Dave mentioned the MGF Centre, and Simon said that BLiNK Motorsport sometimes know of owners wanting to dispose of the K when they have converted their Elise to a Honda engine. They've actually got a VHPD engine from a 340R for £3,500 which is both good (considering it includes the Elise gearbox) and bad (because it's probably 12k miles of thrashing round a track). I also phoned PTP to get a price on a new engine, but they haven't yet returned my call. I spoke to Brian Hill at BGH about gearboxes. They don't have any Rocket boxes at the moment but they now do an E7 which wasn't on the list I saw before. It gives me a choice of ratios (the ones I'll go for are emphasised in the table). I need to take my gearbox in, Brian will open it up, replace what needs doing and 10 days later I can pick up an as-new gearbox. This will cost the rather large sum of £970, or possibly a bit less depending upon what the exact spec of my gearbox is. The thought crossed my mind yesterday that I should also dry-sump the new engine. In purely financial terms it's probably not worth it since I could get about 2 standard used engines for the price of the dry sump kit, but it may be worth it to reduce future hassle. There's a big discussion on Blatchat about which is better - the Caterham or Pace system, but I think they both work so it would come down to price. Caterham want £2000, while Pace are more difficult to estimate since the basic kit is £1000 but there probably a couple of hundred pounds of extras to buy. Even if I don't dry-sump then at least this engine will have the advantage of having the Apollo tank fitted from the start. 11th November 2003. Fingers crossed, I have an engine supply. The deal fell through on the one I originally tried for, so now it's mine! I'm going to collect it early on Saturday, £650. The plenum is missing but the seller said he'd throw in a VVC plenum for nothing, which will do the job if I don't get the TBs fitted before the car makes it back on the road. 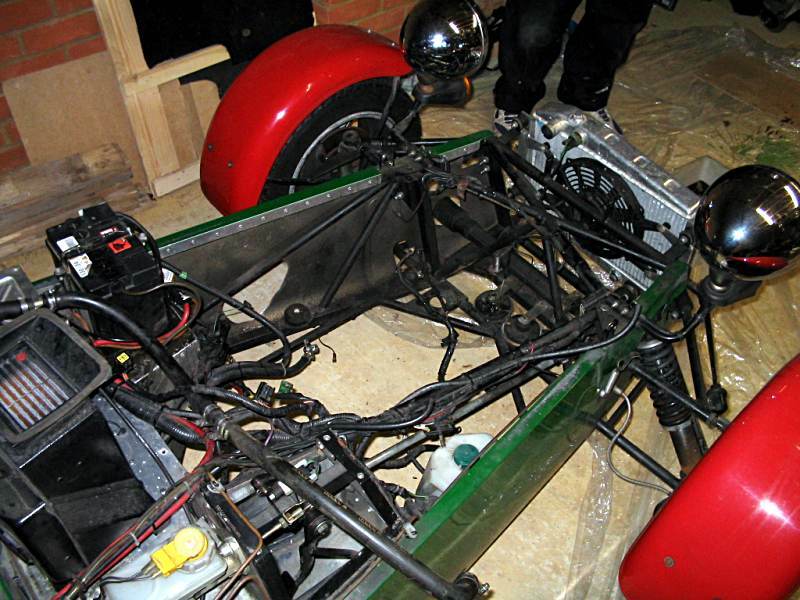 I had some excitement today when I was offered a package of a 200+ bhp DVA engine and a Caterham 6-box. The price was reasonable (but not dirt cheap), but I ended up turning it down. I have said before that I think 160-170 bhp is perfect for what I want in a Seven, and I stand by that. With every day driving I think 200+ bhp is too highly tuned. I also value my overdrive 5th gear on the motorway, and 6th in the Caterham box is like my 4th. It would have been an awesome trackday machine, but it wouldn't be very pleasant as a commuter car. We had to remove the passenger seat to get at the screw holding the transmission tunnel cover on because the sliding mechanism won't. We tried to remove the driver's seat for the same reason, but one of the nuts wouldn't come off a bolt under the car. Probably because the end of the bolt had been ground away. Phil suggested hacksawing the bolt off but my hacksaw hasn't yet recovered from performing surgery on a spanner. Phil's going to bring his round tomorrow. We couldn't get my Powerspeed exhaust apart, which is necessary before we can remove the primaries from the engine bay, which it looks like we need to do in order to get enough room to remove the engine. It looks like we might just be able to squeeze the engine by but it would be awfully tight. I've posted to Blatchat to see whether anyone there has any bright ideas. We didn't do too badly for mess, anticipating most of the oil, water, and petrol leaks. 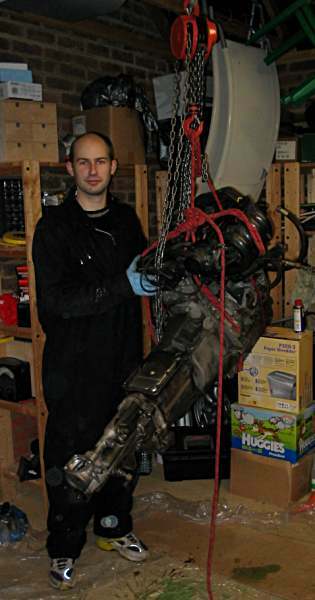 Tonight we're hoping to actually get the engine and gearbox out, with the aid of a hoist borrowed from Steve. 15th November 2003. The engine and gearbox are out! I can't remember when Phil left - probably about 1:30am. To get the exhaust separated we ended up using a combination of WD40 down the primary / secondary joint, smacking various bits with a mallet, and grabbing the tail and wiggling. Once it started to give (which took a lot of effort) it came off quite easily. We also had to remove the heater in order to free up the transmission tunnel cover - I might not bother putting that back since it doesn't do a lot with aeros fitted. I'll need an ali plate though to cover the hole that'd be left in the scuttle. Phil's knotting skills came in handy for rigging Steve's engine hoist from the rafters in the garage. There were no real problems getting the engine and gearbox out together, although they were stuck pretty well together and a bit of insistent leverage was needed to get them apart. Big thanks to Phil for doing most of the work over the last couple of nights. With his guidance everything went smoothly and seemed easy - I'm sure that wouldn't have been the case if I'd been on my own. All done I didn't get to bed until about 3am, then I was up at 6:30 to get down to Dorset in order to pick up my "new" engine. It looks to be in good condition, and I was surprised how easy it was for two people to move it. 16th November 2003. I took the gearbox down to BGH this morning. Brian's workshop is in what seemed like a complex of sheds down behind his house. If you've got a gearbox fetish then you must visit this place... There was a gouge around the bit at the end of the gearbox that the clutch release bearing rests on, suggesting that there was a problem with the bearing. I'm planning to change that anyway whilst the engine is out. On the way home I dropped my gear lever in to Phil's place because he had offered to do a quick-shift conversion on it whilst I wait for the others bits to come together. 21st November 2003. I talked to Dave Andrews today. He said that he could fit some of the K04 kit to the engine whilst it is out of the car, but other stuff needs to be done when it's in. So it seems like the best way to do this is is to get the engine in the car and running, and then take it to Dave for the rest of the kit to be fitted. However, in order to do this I need to fit a rotor arm spigot to the end of the inlet cam (requires removing the cam from the engine), move the cam cover and coils from my old engine (so that the engine looks like an EU2), and get an Emerald with an appropriate map (so that I don't need the extra fuel pressure regulator). Then the path heads tortuously off to oblivion (my thought process goes something like, "well if I'm going to have to remove a cam anyway then why not put in the new cams? Hmm, I'd need to fit the verniers too, so I need to buy some dial guages, and make some custom brackets. Then I won't have an appropriate map... Better fit the throttle bodies too. Ooo, all done!"). One thing is certain - I need to order a bunch of bits from Caterham, and the K04 kit from Dave (since I may need the Emerald and buying the kit is cheaper than buying all the bits separately). I've already bought a USB / serial adapter so I should be able to program the Emerald with my work laptop. Getting in touch with Dave is proving more difficult that I would like, because AOL seems to drop my messages on the floor rather than deliver them to his inbox. 25th November 2003. A Blatchat posting pointed me towards the March 2003 issue of Low Flying which has an article about the fitting of a Pace dry sump system. Phrases like "relocate the water header tank to the right-hand side of the car" make me nervous of tackling this at the same time as the rest of this engine work. 26th November 2003. Phil now has a "waffle" page, and he's written about the help he's been giving with my car. 9th December 2003. I haven't had time to update this page as often as I should, but fortunately Phil's been waffling with details of our trip round London last Saturday to pick up my gearbox from BGH, lots of parts from Caterham, and whizzy engine bits from DVA, all in the same day. He's also been fettling my throttle bodies. Considering how frustrated he's got over this, it would have been a big mistake for me to have a go. 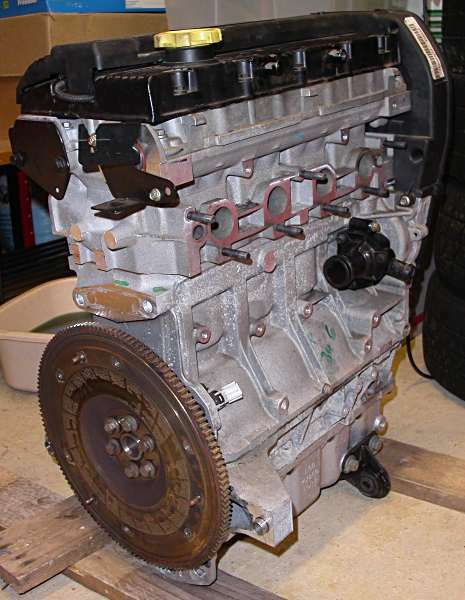 Engine saga: part 2, part 3. This page is http://www.strangely.org/diary/200311/engine.html. It was first published on Sunday 9 November, 2003 and last updated on Wednesday 23 June, 2004.